Onconephrology is wide subject ranging from renal cancers, to side effects from chemo- and radiotherapy to renal paraneoplastic processes like amyloidosis. This region likewise tries to sample this diversity by taking teams from all over the field to populate the region. In the top position there are two surgical approaches to renal cancer: radical nephrectomy versus a more sophisticated nephron-sparing strategy. Next is a face off of two modern chemotherapies and their attendant nephrotoxicities. A very interesting coin flip of a contest. What is the possibility and wisdom of kidney transplant after malignancy? Or the risk and reality of malignancy after kidney transplant? 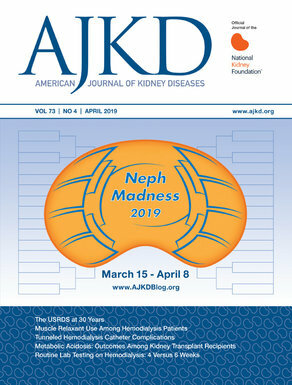 Rounding out the bracket we have a pair of paraneoplastic syndromes, cast nephropathy from myeloma tipping off against amyloidosis. Dr. Rosner is the Henry B. Mulholland Professor of Medicine in the Division of Nephrology and Chairman of the Department of Medicine at the University of Virginia. Dr. Rosner has a strong interest in education and serves on a number of national committees devoted to educational aspects of medical training. He is co-director of the ASN Board Review Course. His research interests include the pathogenesis and management of disorders of sodium and water balance, the treatment of polycystic kidney disease, and the development of novel therapeutics for acute kidney injury. Dr. Rosner has published over 100 research articles in peer-reviewed medical journals, and serves on the editorial boards of numerous journals including AJKD and CJASN. A little or a lot? Offense or defense? Nephrology versus urology? This matchup is not only the treatment of renal cancer, but also about saving valuable residual kidney function. Now, what about the surgery to save the kidney? Partial nephrectomy (also termed nephron-sparing surgery) is the gold standard for the treatment of patients with small renal masses (SRMs; ≤4 cm). Surgically treated localized renal cell tumors < 4 cm carry an excellent prognosis with a >90% 10-year recurrence-free survival rate. Do we go with complete nephrectomy in such cases or advocate nephron sparing surgery? The goal of a partial nephrectomy is to spare residual normal nephrons, thus preserving renal function, particularly in patients who at the time of diagnosis have some form of CKD. CKD is prevalent in this population and sparing renal function may improve long-term global outcomes. This seemingly radical approach to treatment is based on evidence that patients in this category are at high risk of recurrence following surgery. But partial nephrectomy might have somewhat similar renal function and cancer outcomes in many studies. One randomized trial comparing radical nephrectomy vs partial nephrectomy for low stage renal cancers showed a 10 year superiority that was statistically significant for radical nephrectomy compared to partial nephrectomy. Another study that looked at analysis of Medicare beneficiaries with T1a tumors reported significantly improved overall survival with partial nephrectomy when compared to radical nephrectomy. However, this study was retrospective. With respect to renal functional outcomes, the European Organization for Research and Treatment of Cancer (EORTC) conducted a randomized trial compared nephron-sparing surgery versus radical nephrectomy. There was a significant reduction in the incidence of moderate and severe renal dysfunction in the partial nephrectomy arm compared to the radical nephrectomy arm. While partial nephrectomy has not been shown to improve the overall survival outcome, preservation of renal function might be important in the CKD population. You decide: will partial or radical nephrectomy move on to the next round? Specific antiangiogenic medications target the vascular endothelial growth factor (VEGF) molecule. A classic example of such an agent is bevacizumab, a recombinant humanized monoclonal antibody that binds and sequesters the VEGF molecule. The tyrosine kinase inhibitors (TKI) such as sunitinib, sorafenib, axitinib, and pazopanib not only inhibit VEGF, but also have inhibitory activity against other receptor tyrosine kinases, such as the platelet-derived growth factor receptor or cKit. Both these agents are used in the treatment of renal cell cancers. While the pure VEGF inhibitors are more toxic to endothelial function, the tyrosine kinase inhibitors are not quite as discreet. It’s a full court press. Since the tyrosine kinase inhibitors have an anti-VEGF effect, similar renal thrombotic microangiopathy-like findings can be seen with them as well. A preeclampsia-like syndrome has been described in patients on sunitinib therapy. Sunitinib and sorafenib are both being utilized for the treatment of renal cell and bladder malignancies. They have have the striking similarity in terms of their kidney effects as anti-VEGF agents. Other biopsy findings such as acute and chronic interstitial nephritis have been reported with these agents as well. Both sunitinib and sorafenib can cause a see-saw effect of chronic interstitial and endothelial damage leading to CKD. The multitargeted tyrosine kinase inhibitors used in treatment of CML and GIST tumors, such as imatinib, have a different form of renal effects. While the mechanism is not clear, recent studies have demonstrated increased kidney dysfunction in a large series of patients with CML receiving imatinib (the blockbuster drug that ushered in the tyrosine kinase inhibitor revolution). In addition, newer tyrosine kinase inhibitors such as dasatinib and nilotinib have been linked to CKD. Inhibiting platelet-derived growth factor receptors expressed on osteoclasts. Decreasing bone resorption and calcium and phosphate egress from the bone. PTH levels tend to increase and phosphaturia develops. Tyrosine kinase inhibitors represent a growing class of antineoplastic agents. They are the fastest-forty of the teams, with quick onset and unrelenting in their tenaciousness, like Arkansas in the Nolan Richardson era. They could be a true contender to make it far in the Onconephrology bracket. However, they face a difficult challenge against a formidable team: VEGF-Inhibitor toxicity. Why do the VEGF inhibitors matter to nephrologists? Well, the renal toxicity seen with these agents are very fascinating. Kidney biopsy findings due to VEGF inhibitors helped to define the pathophysiology of pre eclampsia. These agents can lead to a preeclampsia-like syndrome in some patients. The renal involvement in preeclampsia is characterized by hypertension and proteinuria. The kidney biopsy shows glomerular capillary endotheliosis and thrombotic microangiopathy (TMA). The pathophysiology of these phenomena is explained by excess placental soluble fms-like tyrosine kinase 1 (sFlt-1), which binds circulating VEGF and placenta growth factor (PlGF) and stops them from interacting with endothelial cell surface receptors. Similarly, anti-VEGF agents like bevacizumab can induce a preeclampsia-like state. Bevacizumab has been used for the treatment of several malignancies such as renal cell, ovarian, and breast cancer. The most common side effect is hypertension, which has been reported in up to 67% of patients. The hypertension is dose dependent. In addition, this chemotherapy can worsen the pre existing hypertension. ACEi and CCB can be used to treat the hypertension. The mechanism of the hypertension seems to be related to nitric oxide production, direct vasospasm and endothelial injury. Proteinuria is fairly common as well and is related to TMA. Both the hypertension and proteinuria are dose related. The development of hypertension is also linked to a positive anti-tumor response. Importantly, the kidney injury from this bevacizumab can be irreversible. At first, these two teams sound almost identical, but they represent two fundamental concepts of transplant care. How long do you have to wait to receive a kidney transplant after having a malignancy that is successfully treated? And how do you deal with malignancy that develops after receiving a kidney transplant? This is especially a concern given the fact that patients with kidney transplants are on medications that promote rather than suppress malignancy. The decision to take a patient with a functional kidney transplant off or even modify the antirejection medication regimen after the development of malignancy is a difficult one. The most common malignancies after kidney transplantation are skin cancers. Other solid tumors are common as well compared to the general population. Hematologic cancers are usually post transplant lymphoproliferative disorders (PTLD). Although studies have shown that certain cancers are more likely to occur in patients with CKD or with end stage kidney disease, the overall incidence of cancer clearly increases further after kidney transplantation. After kidney transplantation most cancers have an elevated standardized incidence ratio (SIR). The SIR is calculated by dividing the observed cases of malignancy by the expected cases of malignancy. Kidney cancer is seen at a much higher rate in kidney transplant recipients, and this is secondary to the elevated risk of malignancy associated with acquired cystic kidney disease above and beyond what is seen in the ESRD population. The four most common cancers seen in transplant patients are cancer of the lung, liver, kidney, and non-Hodgkin lymphoma. Although cancers such as Kaposi sarcoma have a much higher rate post-transplant, they are still rare compared to other more common tumors. It is thought that the impaired defense against viruses, impaired immune surveillance against tumor cells, and upregulation of TGF-beta may be mechanisms involved in reasons of increased cancer risk post kidney transplantation. Found to have a cancer recurrence ~22%. Rate of recurrence varied, based on the time period they were treated before transplantation, with those treated within 24 months prior to transplantation having the highest recurrence rate. Recurrence rate also depends on the type of tumor. – High rates of recurrence are seen with myeloma, breast cancers, sarcomas, nonmelanoma skin cancers, and renal cell cancers. – Lymphomas have a lower recurrence rate. The history of cancer prior to transplantation is also a predictor of increased mortality after transplantation. One study revealed a 30% increase in mortality in patients with pretransplant cancer mainly in solid organ transplants. A very valuable consultation tool is available for nephrologists to use via Israel Penn registry to help predict recurrence and time needed to wait for transplant. This is a really excellent tool. While there is a risk, a transplant after malignancy that is in remission helps the patient. Malignancy after transplant seems to be a bad omen. From a patient’s perspective, we have a potential winner here. This is a tough battle. It’s the battle of the blues: Duke versus UNC. Tubules versus the glomerulus. While myeloma kidney is a tubular disorder, all forms of amyloidosis are mostly a glomerular and vascular disorder. However, both have one thing in common–cancer-derived paraproteinemia. Let’s start with the tubules. Myeloma kidney is also known as light chain cast nephropathy and is the most common cause of kidney impairment in patients with multiple myeloma. Although it is commonly referred to as myeloma kidney or myeloma cast nephropathy this entity can also occur in patients with Waldenstrom macroglobulinemia and less commonly in CLL. The free light chain burden is the most important causative factor. Recent data highlights the pathophysiology of the free light chains (FLC) in the kidney. Recent studies have highlighted that they come in contact with the Tamm Horsfall protein (THP) in the loop of Henle. Experimental evidence with cast nephropathy suggests that intraluminal casts formation is the proximate cause of AKI and the most likely first step in the progressive decline of the renal function. When IV infusion of monoclonal FLC was given in rats, elevated proximal tubular pressures were noted and decrease in single nephron GFR with formation of intraluminal protein casts. How do you treat cast nephropathy? Renal risk from myeloma is very dependent on the burden of circulating monoclonal FLC rather than the amount of M protein spike. The advent of FLC assays have really helped the diagnosis and management of renal dysfunction seen in patients with paraproteinemias. In an elegant paper in JCI, Ying et al investigate inhibiting the interaction of FLCs with THP. There is an area on the FLCs called the complementarity determining region 3 (CDR3) that is very important to allow interaction with the THP. The investigators show that when you competitively inhibit that peptide region, the FLCs did not bind to THP in vitro. Then in a rodent model of cast nephropathy, this inhibitor of CDR3 prevented cast formation and prevented manifestations of the kidney injury in vivo. This is an interesting study as it doesn’t treat the underlying disease (multiple myleoma) but attempts to treat in an animal model a consequence of the disease. Cast nephropathy which leads to intratubular obstruction can quickly lead to dialysis in many cases. This is a study that shows by using the CDR3 inhibitor, we prevent this light chain and THP combo and prevent the precipitation in the tubules. In most cases, treating the underlying cancer will help the kidney but having an alternative method will be amazing! This is the latest in cast nephropathy research. What about the use of plasmapheresis (PLEX)? There have been 3 randomized trials and the results are mixed. Two of the trials including the largest one were negative; however, serum FLC was not used as a marker of response in any of the trials and kidney biopsy was not used to confirm the diagnosis in the largest study (biggest limitation). A Mayo clinic report in NEJM found high rate of renal recovery (86%) when PLEX was combined with a bortezomib-based therapy but others have found nearly as high rates of recovery with bortezomib-based therapy alone. Finally, the high-cutoff (HCO) dialyzers with molecular cutoffs as high as 45 kDa have been used to remove FLC. Extended hemodialysis with the HCO 1100 dialyzer permits continuous and safe removal of FLC in large amounts (1.7 kg of FLC was removed from one patient over a period of 6 weeks). Randomized trials are currently being conducted with HCO dialyzers in cast nephropathy. What’s new in amyloidosis? Tools are starting to emerge that help to identify the type of amyloidosis. Everyone is aware of the alphabet soup that one needs to recognize in the various forms of amyloidosis. Accurate typing of amyloid is necessary since treatments for different types of amyloid are themselves very different. Amyloidosis of the kidney is typically classified as being either one of two types: AL or AA. These types are differentiated by their immunofluorescence and immunohistochemistry studies. AA amyloidosis is usually secondary to chronic illness such as rheumatoid arthritis, familial mediterranean fever, infections, and sometimes malignancies like renal cell and Hodgkin lymphoma. A novel technique has come into light in helping to diagnose amyloidosis. It is the LMD/MS technique or laser microdissection combined with mass spectrometry. Researchers from the Mayo Clinic have used this technique to diagnosis even rare cases that might not have been picked up on regular staining via AA or AL and perhaps even medullary amyloidosis. They have demonstrated that LMD/MS is can sensitively diagnose and type amyloidoisis, especially in problematic cases. In the method, ~10-μm-thick sections of formalin-fixed paraffin-embedded tissues are Congo Red stained, and glomeruli with Congo Red deposits are subjected to LMD. The microdissected material collected is analyzed by liquid chromatography electrospray tandem mass spectroscopy. The output includes the total number of mass spectra that can be matched to protein using proteomic software. A higher number of mass spectra denotes greater abundance and will generally provide more extensive amino acid sequence coverage. A classic case was published in NEJM many years ago on how diagnosis of the type of amyloidosis was crucial. Thus specific proteins were identified and diagnosis was made. So, now using this technique, one can be as specific as the protein involved in amyloidosis. This new technique still needs to be widely accepted by the pathology community. With the enlightening new research happening in both cast nephropathy and amyloidosis, you decide if you prefer the tubule to move ahead or the glomerulus! – Post written and edited by Drs. Kenar Jhaveri, Matthew Sparks, and Mitch Rosner. Where do you put CLL? Chronic Lymphocytic Leukemia?